Well when I woke up this morning it was raining outside. 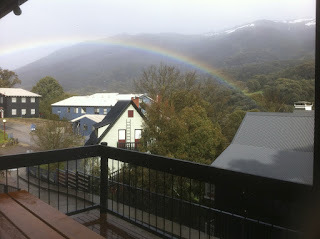 So decided I'd spend a couple of days in Thredbo. Will be back on the bike on Monday. Later on in the morning it stopped raining, so I decided to go for a walk along the river. 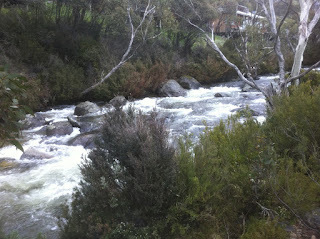 There are lots of cascades on the Thredbo River. 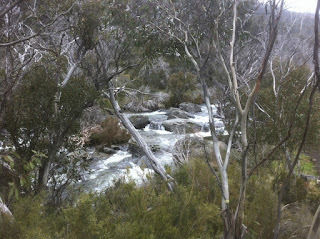 It is also surrounded by very lush vegetation. As I was walking back it began to rain again. So when I got into town I stopped at the bakery and got a coffee and pie to have back at the hostel. There are a number of other walks you can do around the area. Hopefully it'll stop raining later tomorrow and I can do another. Until Monday, enjoy your weekend.